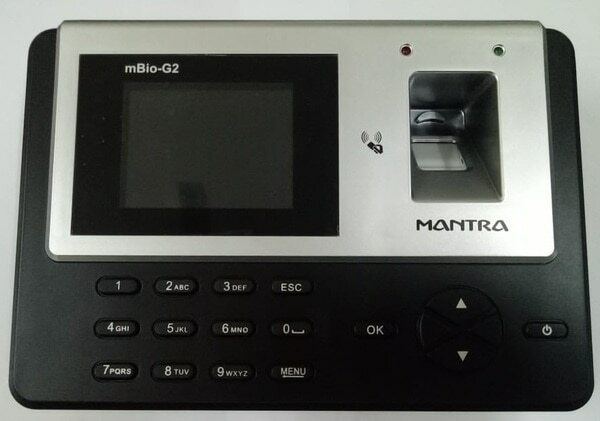 MANTRA MBIO G2 BIOMETRIC FINGEPRRINT ATTENDNACE SYSTEM MBIO-G2 IS SUITABLE FOR TIME ATTENDANCE RECORDING AND EMPLOYEE MONTHLY ATTENDANCE DATA COLLECTION WITH DOOR ACCESS CONTROL SECURITY FEATURE. THIS IS ADVANCE MODEL OF MANTRA AND HAS VERY HIGH CAPACITY RESOLUTION OF FINGERPRINT SENSOR WITH HIGH SOPPEED PROCESSOR. MANTRA MBIOG2 IS SUITABLE TO BE USED FOR EMPLOYEES UP TO 1000 AND IR IS HIGHLY REALIABLE FOR OFFICE TIME ATTENDANCE MANAGEMENT.